Why more men and women are getting face tattoos (and why you may want to consider one for yourself). 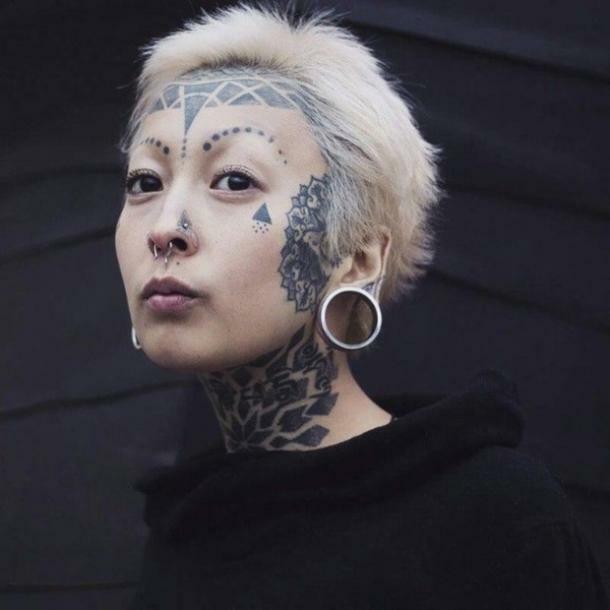 Face tattoos have become more recognized in the mainstream — modern women are making the choice to adorn their visages in this way more often. But face tattoos aren't a new tattoo trend. Believe it or not, tattooing the face though has been part of human history for thousands of years. The earliest find is Otzi the Iceman of the European Alps, a discovery that's dated back approximately 5,300 years ago. Otzi had over 60 tattoos over his body, including tattoos on his face. Both men and women have used their own designs in most cases for tattoos, with really no place on the body off limits — faces included. As a child, I used to spend hours looking through my Grandfathers collection of hardback National Geographic magazines, where I saw both Polynesian Tattoos and those of the Maori, natives to New Zealand. The women and men of the Maori people use the facial tattoo, in bold striking tribal designs called Ta Moko. Facial tattooing is still a part of life for many people, of their human experience. In the years between 5,600 BC and now, tattoos of all sorts are still widely popular and showing no signs of diminishing. Tattoos on the face can be quite beautiful, often using symbols of spiritual and cultural significance. For instance, the Native Alaskan women are slowly coming back to their ancient cultural practice of tattoos on their face after generations of having the tradition stifled by politics and religion. The significance of these markings shouldn't be underestimated. Facial tattoos are an obviously a bold choice for a woman or man to make, more than any other location on the body. Our faces are most often what we put forth first in this world. Women overall have endured more ridicule and criticism about their facial appearance than men. A woman who chooses a tattoo for her face may very well be a way to take back control of how they are perceived in a direct "in your face" way. Take a look at 10 of our favorite face tattoos for women to get an idea for which tattoos might suit you best. 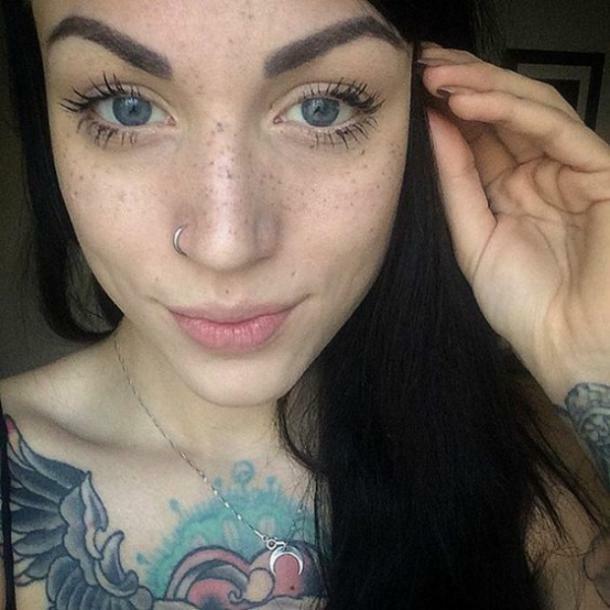 In our modern times, women are even choosing to tattoo freckles on their faces in order to emphasize "cuteness". 2. Halsey's Queen of Diamonds face tattoo. 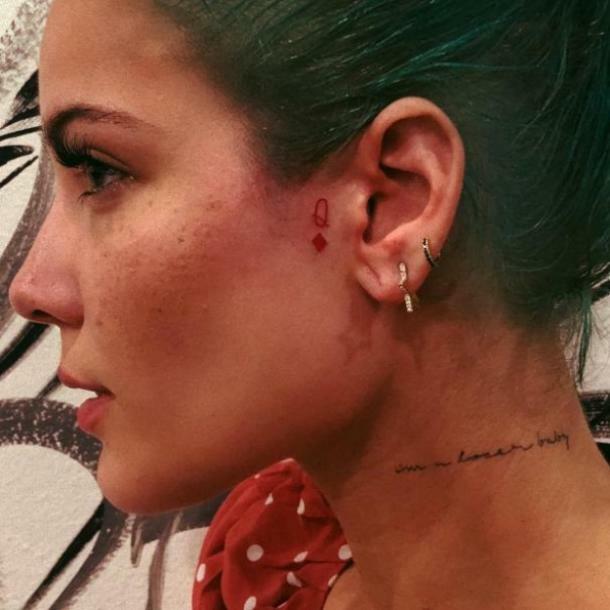 Halsey recently revealed her first facial tattoo. Halsey indicated she doesn't currently want any others on her face and hasn't revealed her personal meaning behind the tiny "Q" and diamond. Though It is dainty and well placed for easy hiding if need be. 3. Tribal tattoo designs with dots and triangles. Dot tattoos have had a bad rap as prison marks, but the dot has meaning in different cultures completely unrelated to prison or gangs. 3 Dots, for instance, could represent The Trinity and seven as in the case of this model, could also symbolize protection as the Mayan's believed it did. The Triangle is also a sacred geometric symbol with vast meaning among many different cultures. 4. 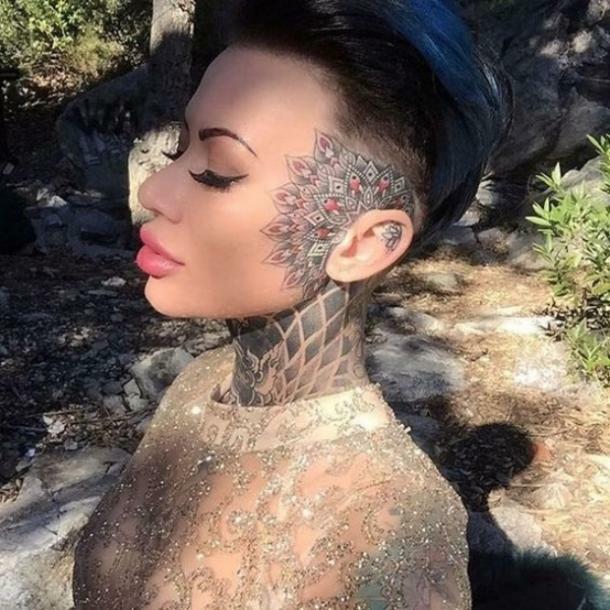 Kat Von D brought face tattoos of stars into the mainstream. Kat Von D has said her facial stars are a way for her to express her femininity while still being heavily tattooed. Kat Von D purportedly also choose the stars as homage to Motley Crue's song "Starry Eyes". 5. These stunning tribal tattoos and runic designs are steeped in cultural and spiritual significance. The Berbers' of North Africa have a tradition of tattooing the face as a means of therapeutic care, even to treat in some cases. The diamond shape with small crosses is referred to as the "Partridges Eye", It is worn to endow the wearer with agility and beauty. 6. Chin tattoos called "Moko Kauae". 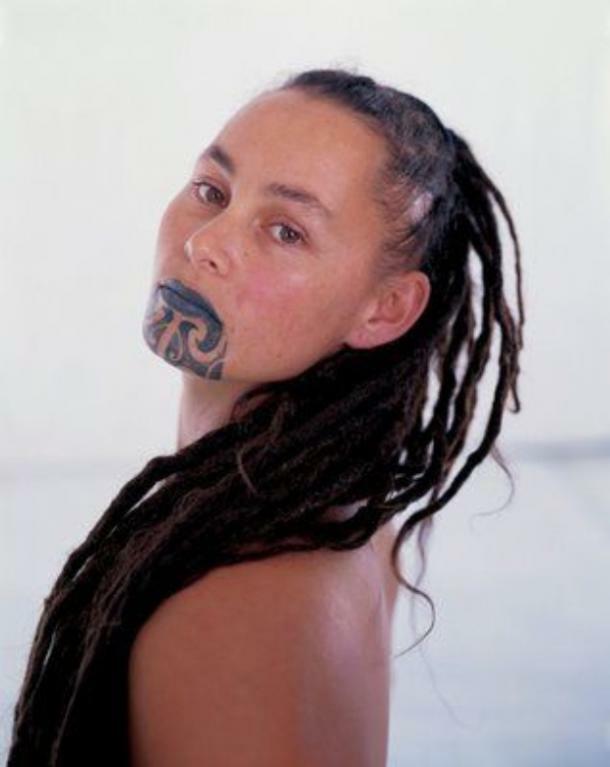 The Maori women and their striking chin tattoos called Moko Kauae. These are meant to represent their true selves, that the symbol is inside them close to their hearts. When they are ready the tattoo artist simply brings it out. The Moko Kauae are deeply spiritual symbols for the Maori women. 7. Paper airplane tattoos are showing up on faces too, like Kehlani's. 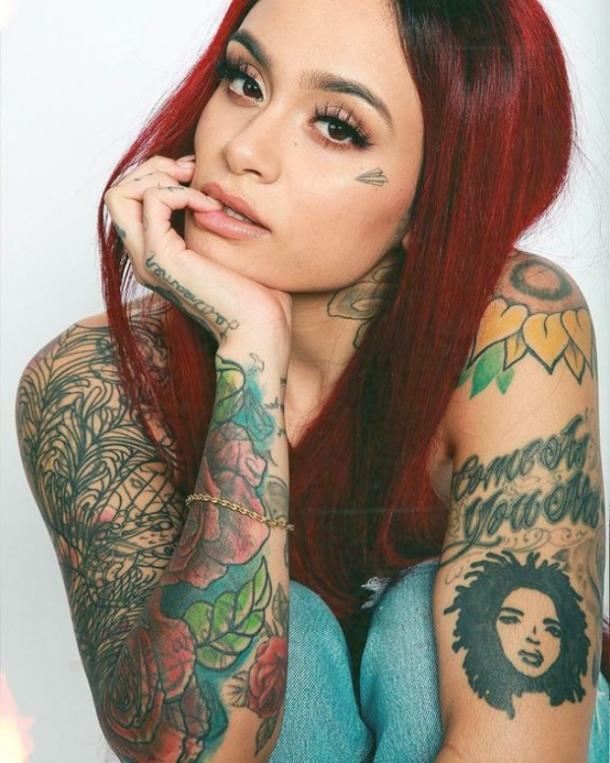 Singer, songwriter and dancer Kehlani's Paper airplane is said to mean "stay above" as a mantra for how she lives her life. She has several other facial tattoos such as dots beneath her eyes. 8. Flower tattoos are simple and pretty ways to adorn the perimeter of the face. Floral Facial tattoos are a lovely way to embrace the feminine and show that a woman can be as strong as a man. 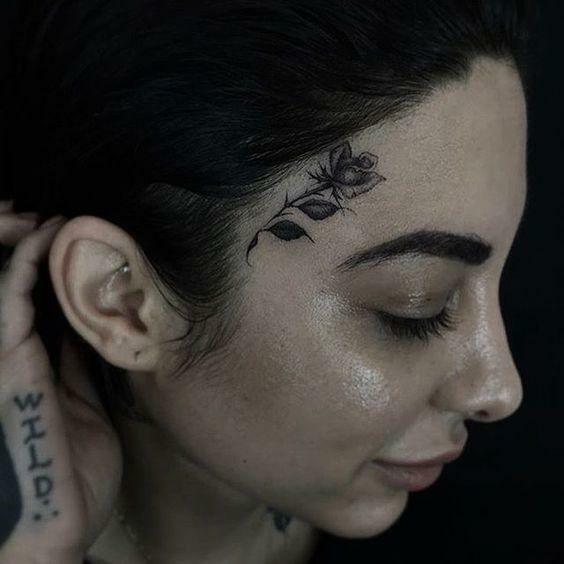 Flowers, with their delicate beauty, are used as facial tattoos by both women and men and could convey many different meanings depending on the individual. 9. Mandala tattoos and sacred geometric tattoos create stunning works of art. Mandalas are a part of the human mythos of sacred geometry with meanings steeped in history. A Mandala tattooed on the face could be an indicator of a person who recognizes their sacred soul journey. 10. A tattoo with initials, monogramming your face. 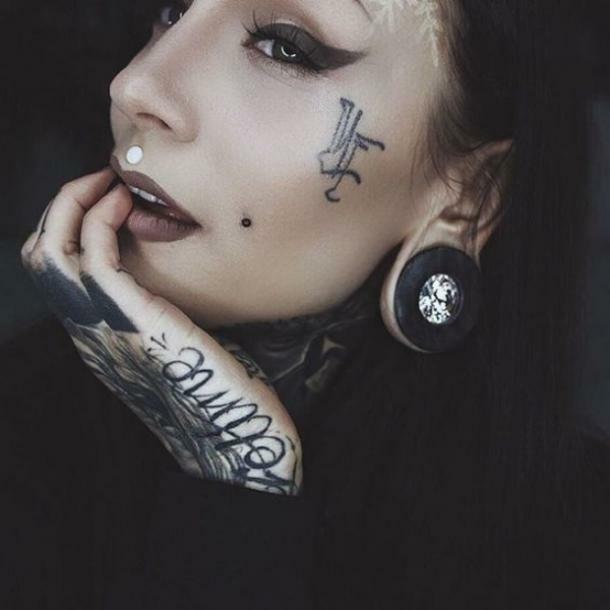 Monami Frost has 4 facial tattoos, a scalpel, a snowflake, the word "devotion" and the one pictured above, her initials. She says her husband, a tattoo artist gave her the marks, she was his first facial tattoo client. Amanda Ilene Sawyer is a writer and Mississippi native who is interested in science, anthropology and spiritualism. When she’s not writing about astrology, numerology and tarot, she enjoys running her business and designing macrame pieces for her etsy shop.